I really don't need any more hand creams at the moment, but when I discovered on my last trip to The Body Shop that it was my fourth visit using my Love your body card and that I was entitled to a free gift worth up to £5, I knew I wanted to try one of these. As it happened this was on a buy one get one half price offer with one of the other items I bought and so instead of the already bargainous (I do realise that's not actually a word!) £3.50 this usually costs I got it for just £1.75. These are available in a massive eight fragrances (Shea, Coconut, Honeymania, Mango, Moringa, Satsuma, Pink grapefruit and Strawberry) and at first I really couldn't decide what to try before I settled on one of my all time favourite fragrances, Coconut. Of course, being an impatient beauty blogger I couldn't leave trying this until I'd at least used up the two hand creams I currently have on the go, I had to try it straight away and I think this may now be my new favourite hand cream. This does contain Community Fairtrade Coconut oil from Samoa with the Coconut oil being listed about half way through the list of ingredients. Half way through the ingredients list isn't too bad, it means there's more than just a minuscule amount in there, but for me in terms of this sort of product (meaning a hand cream) it's more about it smelling of Coconut than it actually containing any. Although obviously if it's called Coconut it's nice to see at least some Coconut in there! It also contains Sweet almond oil (which is the highest placed oil ingredient on the list), Soybean oil and Shea butter. When I first squeezed some of this out onto my hand I was surprised by how soft it was, I'm not sure why but for some reason I was expecting it to be a thicker cream. It absorbs really quickly, within a couple of minutes there's no trace of it left on the skin, and it leaves skin feeling soft and moisturised. One of the things I love most about this is that the scent really does linger on your hands. I'm a 'at least one hand under the pillow' or a t least near my face kind of sleeper and I've found that I can smell this lingering on my hands as I'm falling asleep. I actually find it quite comforting falling asleep while I can smell one of my favourite scents. Maybe if you have trouble falling asleep you could try one in your favourite scent to see if this might help you relax and drift off. For £3.50 this little hand cream is an absolute bargain and as you probably know you rarely have to pay full price for a The Body Shop product anyway because of their amazing offers. I'd definitely recommend grabbing a few of these and popping one in your hand bag, one on your bedside table, one on your desk...you get the idea! You can find The Body Shop mini Coconut hand cream on The Body Shop website here. Are you a fan of The Body Shop hand creams? This sounds so lovely, I love The Body Shops coconut range and didn't realise how cheap their hand cream was! Love anything with a coconut scent so must check this out! Ooh this sounds nice, I have their hemp one somewhere but I have yet to try it - too many hand creams! Mm this sounds great! 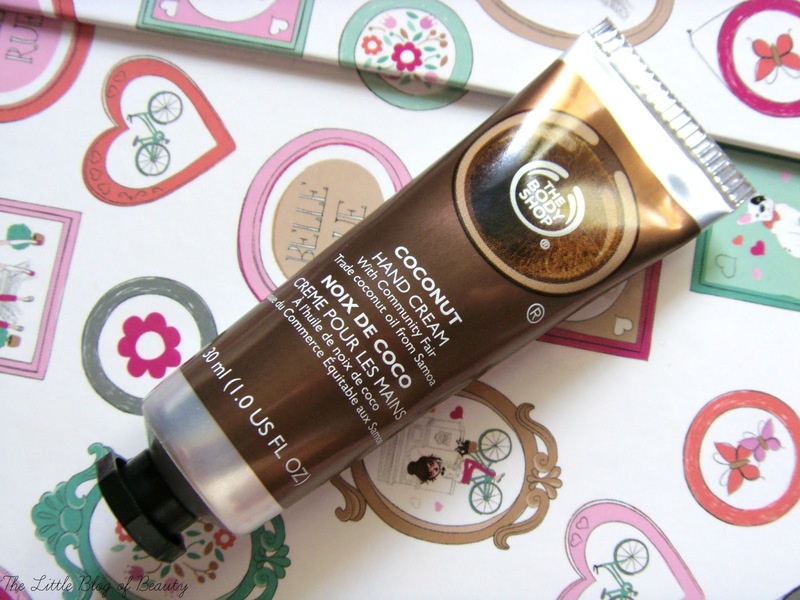 I love coconut and The Body Shop and with autumn approaching, i definitely need to get me some hand cream!